Shrimp fra diavolo is meant to be spicy, but (as is the case in any recipe) you’re in control… so add as little or as much red pepper as you wish. 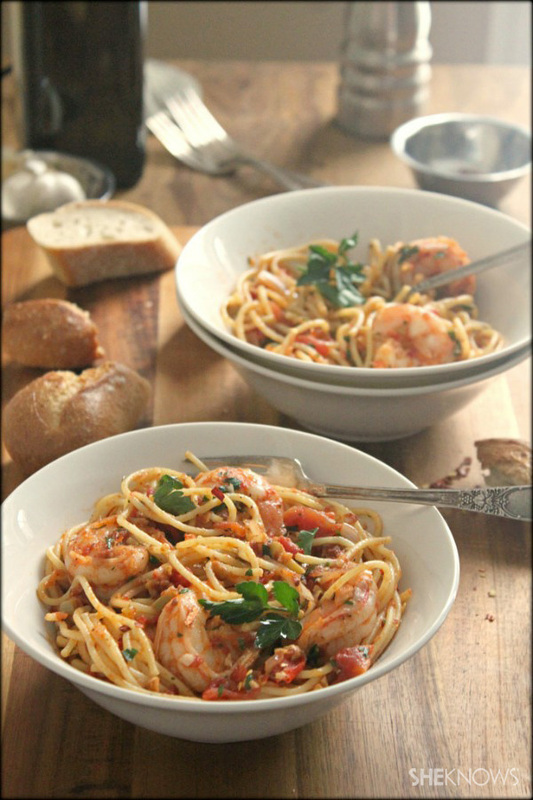 I like to bring the heat, but not so much that I lose the flavor of whatever it is I’m eating… that’s why I love my recipe for fast and simple shrimp far diavolo. As you can see, this pasta dish is not drowning in red sauce, instead the shrimp and spaghetti are coated entirely in a spicy, garlicky, olive oil-based sauce with a hint of quality crushed tomatoes. The cracked green olives, bit of oregano and fresh chopped parsley round out the dish and make it addicting. A good crusty bread on the side is a must! Place shrimp, 1/4 cup olive oil, 2 teaspoons red pepper flakes and pinch of salt in a bowl. Stir around and allow shrimp to marinate. Set aside. Cook pasta al dente, according to package directions. Set aside. Place the other 1/4 cup olive oil into a large frying pan and turn on heat to medium-high. Add shallot and garlic to the pan and cook, stirring often about 2-3 minutes. Add the entire bowl of the shrimp marinating in the oil and red pepper flakes to the hot pan. Allow shrimp to cook undisturbed about 30 seconds, then saute the shrimp on both sides, stirring often, another 1-2 minutes. Add crushed tomatoes, chopped olives, oregano and third teaspoon of red pepper flakes to the hot pan and cook stirring, another 1-2 minutes. Add cooked pasta to the hot pan and, using tongs, coat the pasta entirely with the sauce. Add some of the reserved juice from the crushed tomatoes and or additional olive oil only if desired. Taste and add salt and pepper if needed. Top with fresh parsley and divide among shallow bowls for serving. Serve with crusty bread.